Area 1 of the archaeological site is located at the highest point of Zominthos hill. The main aim of the excavation here is to explore and further reveal the Central Building of the complex. According to the geomagnetic prospection of the site carried out in 2007, the area conventionally named “Room 29,” which is oblong, about 20m. long and 6.5m. wide, is divided by two walls into three rooms. Although two walls of non-Minoan but rather of much later date, were revealed in last year’s investigations, a third strong wall about 4.5m. from the western external wall of the building has appeared. This wall is assumed to be Minoan in date. In contrast some sherds of the upper layers seem to be Roman in date, which may give the chronology of the construction of the two walls that were uncovered last year. At the same time efforts are being made to reveal the northern and western walls of the Central Building by moving the fallen blocks and clearing the soil between and beneath them. If the estimations are correct, the finds up to now indicate that Zominthos Central Building, more than 15 centuries after its initial abandonment, was reused during the Roman period. At that time, it accommodated the people who used the existing Room 29, and who built two transversal walls to divide the area into smaller rooms. The excavation during the following weeks will possibly reveal the uses of this area and will give a clearer picture about the architecture and the later additions to the Central Building. 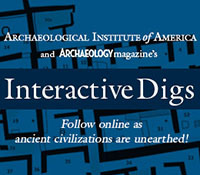 In 1989, along with the restoration of an old–probably of Venetian date–cheese dairy southwest of and close to Zominthos’ spring, an excavation was conducted bringing to light the remains of a building or buildings of Mycenaean age. This year the investigation in this site continues. A geomagnetic prospection has showed a square building east of the old cheese dairy. The excavation aims to reveal, if possible, walls or–even better–a full plan of this structure. With this in mind, we have designed an excavation grid to cover at least this acreage, which is approximately 144m2. Up till now we have been excavating three trenches with interesting finds. They do not yet give a full picture, but there is obviously a long wall, directed on the E-W axis, and also parts of three others vertical to the former. These are most likely of Mycenaean age, as some of the sherds indicate. In the same layer burnt stones are found, it is though too soon to reach any conclusions regarding their presence there. Atop this stratum is another wall, of different construction and orientation. It seems that this one is related to the old cheese diary. The scope of the investigation at this area is to reveal the walls of the structures at the west side of Rooms 13-15 (Ceramics Workshop), as indicated by the geomagnetic prospection. We decided to initially excavate two trenches. The first one, 3.5 X 3m. at the west side of Room 13 and the second, 6 X 1.5m. across the west wall of Rooms 14-15. In Trench 1, we revealed several Minoan period artifacts, including innumerable sherds of handle-less conical cups along with two intact cups, a very usual type of Minoan pottery. Along with these small finds, we also unearthed several coarse sherds from pithoi, jars, and other vessels of medium and large size, and also handles and many sherds of cooking pots. Trench 2 is more problematic, since an old maple tree growing at the middle of it has destroyed the stratigraphy. The first layers from both trenches were removed, and as a result we now have a clear picture of the large slabs that comprised the walls of the neighboring buildings. These stones have been thoroughly documented with photographs and drawings, so we can approximately reconstruct the walls at a later stage. It is expected that during the next week we will reveal the first wall of the structure revealed from the geomagnetic prospection. This entry was posted on Friday, August 27, 2010 at 8:44 am	and is filed under Field Notes 2010. You can follow any responses to this entry through the RSS 2.0 feed. Both comments and pings are currently closed. Thank you for the sharing this season’s plans. I am excited to hear and see more.